So there are a number of different anger theorists who have talked about different kinds of anger styles. But the one I’ll mention breaks anger styles into three forms of expression. So there is “anger out”; and “anger out” typically looks like the kinds of behavior we see with someone that we consider to have a temper. So they become very angry and then they are going to be doing things like yelling, they may be using profanity, they may smash cell phones or pound their fist on a desk, or something along those lines, destroy property. A single anger out episode, in fact, can even cause a heart attack. So that anger expression style has some risks, it also has interpersonal consequences as you can imagine. If this is your employer or employee, this is going to cause problems in the workplace. But likewise, an “anger in” style, where the person is more typically experiencing high levels of anger but they are not expressing them outwardly. So this person, it may not be clear to those around them that they are actually very very angry, but they are having an internal experience, usually of high levels of rumination is what I see in my practice, where they are stewing about it and they are not engaging or dealing in active problem-solving. That, too, has physical implications and is correlated with things like gastrointestinal problems, and there is even some evidence that it might be linked to some forms of cancer. 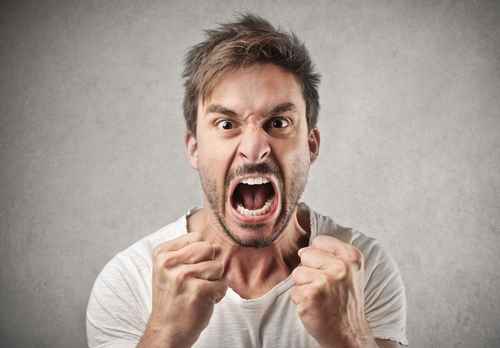 Finally, “anger control” is the expression style that in my practice we are trying to teach clients. And that’s where we’re really looking to have them do a few different things. One, they are going to begin to change their thinking about things, both how they are perceiving situations in the first place, what they’re attributing the cause to, and then thinking about the practical implications and consequences of their actions. By doing so, they are hopefully going to bring down the level of anger in the first place, they’ll also use relaxation to bring down the level of anger, and then they’re going to actively engage in problem-solving and assertively communicate what’s going on for them. So they might share their feelings, they might share what they propose could make the situation better. And that’s really the kind of expression style we’re looking for when we’re dealing with anger management. This entry was posted in Anger, Couples Therapy, Individual Therapy on April 24, 2015 by J Ryan Fuller.